Aurora (/əˈroʊrə/, /əˈrɔːrə/) is a Home Rule Municipality in the U.S. state of Colorado, spanning Arapahoe and Adams counties, with the extreme southeastern portion of the city extending into Douglas County. Aurora is one of the principal cities of the Denver-Aurora-Lakewood, CO Metropolitan Statistical Area (Metro Denver). The city's population was 325,078 in the 2010 census, which made it the third most populous city in the state of Colorado and the 54th most populous city in the United States. Location of Aurora in Adams County and Arapahoe County and Douglas County, Colorado. Aurora is Denver's largest suburb. Aurora's growing population in recent decades has led to efforts for co-equal recognition with its larger neighbor. Former mayor Dennis Champine once expressed the somewhat whimsical notion that eventually the area would be called the "Aurora/Denver Metropolitan Area". Indeed, since the 2000 Census Aurora has surpassed Denver in land area, and much of Aurora is undeveloped, while Denver is more fully built-out. However, such efforts are somewhat hampered by the lack of a large, historically important central business district in the city. Aurora is largely suburban in character, as evidenced by the city's modest collection of tall buildings. In 1979, it was announced that a science fiction theme park would be built in Aurora using the sets of a 50,000,000 dollar film based on the fantasy novel Lord of Light. However, due to legal problems the project was never completed. The script of the unmade film project, renamed Argo, was used as cover for the "Canadian Caper": the exfiltration of six U.S. diplomatic staff trapped by the Iranian hostage crisis. On July 20, 2012, Aurora was the site of the third largest mass shooting in terms of number of casualties in United States history, and the second-deadliest shooting in Colorado after the 1999 Columbine High School massacre. The shooting occurred just after midnight, when James Eagan Holmes opened fire during the midnight premiere of The Dark Knight Rises in a Century movie theater, killing 12 people and injuring 70 others. Holmes was arrested within 2 minutes of the incident, and was sentenced to 12 life sentences in prison with an additional required 3,318 years. The shooting drew an international response from world leaders. U.S. President Barack Obama visited victims, as well as local and state officials, and addressed the nation in a televised address from Aurora on July 22. Actor Christian Bale, who plays Batman in the film, also visited some victims in hospitals. 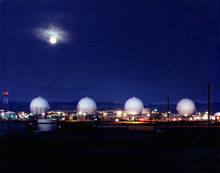 The events marked a turning point in recognition and public perception of the city; rather than referring to the site as being in "Denver" or "suburban Denver", as would have been typical before the event, virtually all media accounts of the incident unequivocally named "Aurora" as its location. Aurora is located adjacent to the east side of Denver. The city's official elevation, posted on signs at the city limits, is 5,471 feet (1,668 m). However, the city spans a difference in elevation of nearly 1,000 feet (300 m). The lowest elevation of 5,285 feet (1,611 m) is found at the point where Sand Creek crosses the city limit in the northwest corner of the city, while the highest elevation of 6,229 feet (1,899 m) is on the extreme southern border of the city in Douglas County, near the intersection of Inspiration and Gartrell roads. Aurora experiences a semi-arid climate (Köppen climate classification BSk), with four distinct seasons and modest precipitation year-round. Summers range from mild to hot, with generally low humidity and frequent afternoon thunderstorms, and Aurora also averages about one dozen tornado warnings throughout tornado season, running from April–July. Although a touchdown does occur every couple of years, tornadoes are typically weak and short lived, but there is a long history of dangerous and devastating tornadoes. Aurora residents typically hear the tornado sirens go off numerous times more than residents in Denver, to the West. All of Aurora is located east of I-25, where tornado alley begins. Hailstorms, at times 1–2'+ deep happen on occasion, and typical hailstorms are very common throughout these months. July is the warmest month of the year, with an average high of 89 °F (32 °C) and an average low of 57 °F (14 °C). Winters range from mild to occasional bitter cold, with periods of sunshine alternating with periods of snow, high winds and very low temperatures. December is the coldest month of the year, with an average high of 43 °F (6 °C) and an average low of 17 °F (−8 °C). The average first snowfall in the Aurora area occurs in late October and the average final snowfall occurs in late April, although snow has fallen as early as September 4 and as late as June 5. Generally, deciduous trees in the area are bare from mid October to late April. In the city, the population was spread out with 27.3% under the age of 18, 6.8% from 18 to 24, 37.6% from 25 to 44, 16.8% from 45 to 64, and 8.9% who were 65 years of age or older. The median age was 32 years. For every 100 females, there were 100.5 males. For every 100 females age 18 and over, there were 95.8 males. The city of Aurora manages more than 100 parks, more than 6,000 acres (24 km2) of open space and natural areas, and six award-winning municipal golf courses (Aurora Hills, Meadow Hills, Murphy Creek, Saddle Rock, Springhill and Fitzsimons). Aurora also is home to several privately owned golf courses including CommonGround Golf Course, Heather Ridge Country Club, Heritage Eagle Bend Golf Club, John F. Kennedy Golf Course (a Denver city golf course, not Aurora) and Valley Country Club. Twenty-seven historic sites and landmarks are managed by the city of Aurora, including the Gully Homestead of 1870, the Victorian-style Centennial House of 1890, the privately owned American War Mothers National Memorial Home, the Art Deco-style KOA Building of 1934, the DeLaney Round Barn of 1902, Lowry Building 800, the interim headquarters for the U.S. Air Force Academy from 1955 to 1958, and Stanley Marketplace, which opened at the former site of Stanley Aviation in 2016. The city of Aurora operates under a council-manager form of government, where the city manager runs the city's day-to-day operations with general guidance from the city council. The Aurora City Council is composed of a mayor and ten council members. Six members are elected from districts the other four are elected at large. The mayor is elected by the entire city. Aurora's mayor role is largely ceremonial, but the mayor does have direct impact on policy issues as the head of city council. The council is nonpartisan, however, parties of members have been listed below for reference. ^ a b "Active Colorado Municipalities". State of Colorado, Department of Local Affairs. February 27, 2007. Archived from the original on November 23, 2010. Retrieved February 27, 2007. ^ "Colorado Municipal Incorporations". State of Colorado, Department of Personnel & Administration, Colorado State Archives. December 1, 2004. Archived from the original on September 27, 2007. Retrieved August 18, 2007. ^ "Aurora History". City of Aurora, Colorado. Archived from the original on September 28, 2007. Retrieved August 23, 2007. ^ Mason, Kara (2018-06-26). "Councilman Bob LeGare named Aurora mayor". Colorado Politics. Retrieved 2018-06-26. ^ "American FactFinder". United States Census Bureau. Retrieved February 1, 2015. ^ "Geographic Identifiers: 2010 Demographic Profile Data (G001): Aurora city, Colorado". U.S. Census Bureau, American Factfinder. Retrieved October 15, 2015. ^ a b "Table 1. Annual Estimates of the Population of Metropolitan and Micropolitan Statistical Areas: April 1, 2010 to July 1, 2012". 2012 Population Estimate. U.S. Census Bureau, Population Division. November 8, 2013. Archived from the original (CSV) on April 1, 2013. ^ "Table 2. Annual Estimates of the Population of Combined Statistical Areas: April 1, 2010 to July 1, 2012". 2012 Population Estimate. U.S. Census Bureau, Population Division. November 8, 2013. Archived from the original (CSV) on May 17, 2013. Retrieved November 8, 2013. ^ "Timeline: Development of the Anschutz campus (Slideshow) - Denver Business Journal". Denver Business Journal. Retrieved April 6, 2016. ^ Cornelius, Cornell (September 24, 2014). "CSU plan presents new hope for U.S. Cancer Patients". Colorado State University. Retrieved November 8, 2014. ^ "World Youth Day memorial signs in need of repair". Archived from the original on September 27, 2011. ^ "AAC Winners by State and City". Ncl.org. Retrieved July 25, 2012. ^ "Consulado de el Salvador en Aurora, Colorado - Inicio". Archived from the original on 2018-01-18. ^ "Aurora is Finally a Household Name...For the Wrong Reason". westword.com. 2012-07-20. Retrieved March 20, 2015. Most of the headlines name-check Aurora as the site of the massacre, rather than tying it to a Denver suburb. ^ "No Site For Domain - Kinsta". tallynsreach-community.com. Archived from the original on April 14, 2018. Retrieved April 14, 2018. ^ "Aurora, Colorado Köppen Climate Classification (Weatherbase)". Weatherbase. Retrieved April 14, 2018. ^ "Annual Estimates of the Resident Population: April 1, 2010 to July 1, 2017 more information 2017 Population Estimates". ^ "Factfinder2census.gov". Factfinder2census.gov. October 5, 2010. Archived from the original on May 20, 2011. Retrieved July 25, 2012. ^ "Aurora (city), Colorado". State & County QuickFacts. U.S. Census Bureau. ^ "Colorado - Race and Hispanic Origin for Selected Cities and Other Places: Earliest Census to 1990". U.S. Census Bureau. Archived from the original on August 6, 2012. Retrieved January 2, 2012. ^ Illescas, Carlos. Aurora reaching out refugee community, Denver Post, December 21, 2012. ^ Bunch, Joey. Denver metro area home to 30,000 Ethiopians, Eritreans Archived March 4, 2014, at the Wayback Machine, Denver Post, July 29, 2013. ^ a b "Aurora Economic Development Council". Auroraedc.com. Archived from the original on July 25, 2011. Retrieved August 5, 2011. ^ "USA/Canada Offices Archived October 5, 2011, at the Wayback Machine." Mexicana de Aviación. Retrieved on January 28, 2009. ^ Aurora Symphony Orchestra (February 22, 1999). "About the ASO". Aurorasymphony.org. Archived from the original on July 25, 2011. Retrieved August 5, 2011. ^ "Aurora Public Library". City of Aurora. Archived from the original on August 1, 2015. Retrieved June 6, 2015. ^ Laura King Van Dusen, "Marie Guiraud: 1860s Pioneer, Mother of Ten, Widowed at Forty-five, Amassed One of the Largest Estates in Park County Up to 1909", Historic Tales from Park County: Parked in the Past (Charleston, South Carolina: The History Press, 2013), ISBN 978-1-62619-161-7, pp. 15-20. ^ Smith, James. "Your Aurora Government" (PDF). Aurora Government. Archived from the original (PDF) on February 1, 2015. Retrieved May 14, 2013. ^ Beyers, Tim (June 1, 2013). "Denver Comic Con: Q&A with J. Scott Campbell". 5280. Archived from the original on May 4, 2016. Retrieved April 22, 2016. ^ Nguyen, Joe (April 28, 2015). "Michelle Waterson signs to fight in UFC's strawweight division". The Denver Post. Retrieved April 22, 2016. ^ "Kerry, John Forbes, (1943- )". Biographical Directory of the United States Congress. U.S. Congress. Retrieved April 22, 2016. ^ "Aurora Sister Cities International". Retrieved July 17, 2014.